The Bald Eagle (Haliaeetus leucocephalus) was chosen as a national symbol of the United States in 1782 because of the bird’s long life, great strength and majestic looks.The bald eagle is not actually bald. It got its name from “piebald” meaning spotty or patchy which aptly describes the bald eagle with its brown body and white head and tail. In addition, the word bald is actually derived from an Old English term “balde” meaning white. 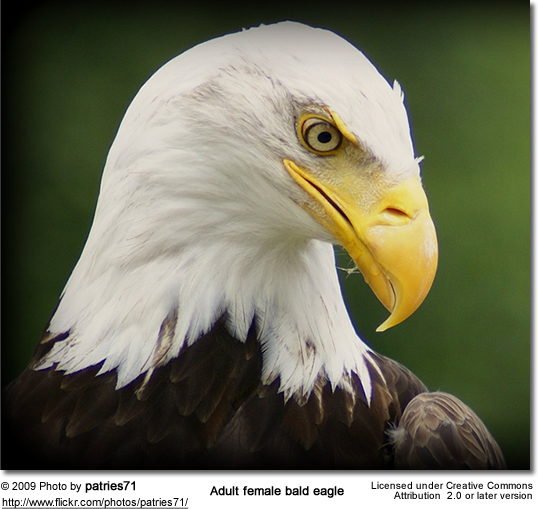 The average adult bald eagle weighs about nine pounds and is about three feet in height. Their wingspan measures from 5.5 to 7.5 feet.